Combines both economy and complete automation. 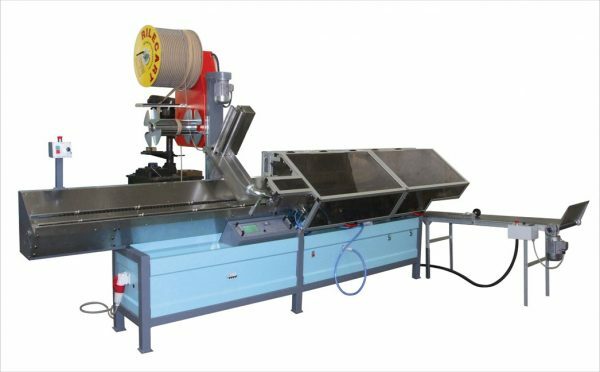 The B-535 is a fully automatic double loop wire binder capable of binding books at the brisk pace of 3,000 per hour. The operator drops a book on the conveyor and the B-535 does the rest. That’s right– it inserts the wire, crimps the wire, and delivers the book onto a conveyor. The machine will bind books from 3.25 X 4 inches up to 12 1/2 X 12-1/2 inches. Diameters can range from 5/16 of an inch to 1 1/4 inch, allowing for a maximum book thickness of one inch. Skip binding up to five parts is attainable. A calendar machine is also available. Simply the fastest piece of wire binding equipment in the world. The machine will automatically bind books at the blinding speed of 4,000 books per hour. Just drop the pre-punched books on the conveyor and The B-599 does the rest. It automatically binds double loop wire books with wire diameters from 5/16″ to 1″. Twin spools allow for a quick changeover. The machine may also be equipped with an in-line punch. The B-796 is the calendar version of this machine. It automatically punches, binds, and inserts calendar hangers into the twin loop wire book at speeds up to 2,300 calendars per hour.